1. NS series Compact MCCB the rated insulating voltage is 750V, suitable for AC 50Hz(60Hz), rated working voltage 690V or below, rated working current is 12.5A to 1250A of circuit. 2. Used in distributing electric energy, and non-frequent breaking in the normal conditions, protecting the current & equipment from overload&under voltage, circuit breaker with rated frame current 400A or below can be used in motor’s non-frequent start, breaking during working, protecting motor from overload, short circuit&under-voltage. 3. 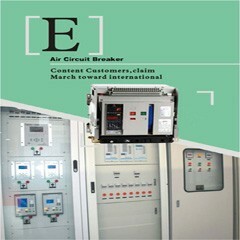 The product conforms to IEC60947-2 standard. Installation: Circuit breaker may be mounted vertically, horizontally or flat on their back without any derating of characteristics. 1. The N-pole breaker has no protection which closing and opening with the other three poles.